Couples can host their ceremony in our beautiful lounge with up to a maximum of 90 people. We can cater for wedding parties between 16-90 guests for a sit down wedding breakfast and up to a maximum of 150 guests for an evening reception. 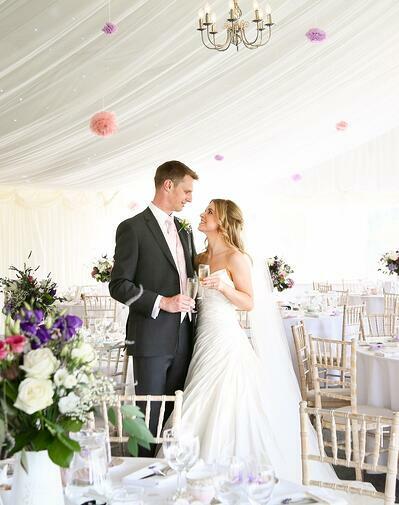 The Coach House Marquee can cater for larger wedding parties of between 60-150 guests for a sit down wedding breakfast and up to a maximum of 250 guests for an evening reception. Wedding ceremonies and can be up to 100 people inside the Coach House Ceremony Room, or if the weather allows then take advantage of the outside ceremony space. If you can't decide which of our gorgeous venues to pick then why not have both, enjoy fully exclusive use of the whole estate and grounds for your wedding day. Choose the grandeur & elegance of the Hall for your drinks reception & wedding breakfast. Then make your way over to The Coach House for the evening party and wow your guests in our fantastic luxury marquee with its stunning starlit ceiling.